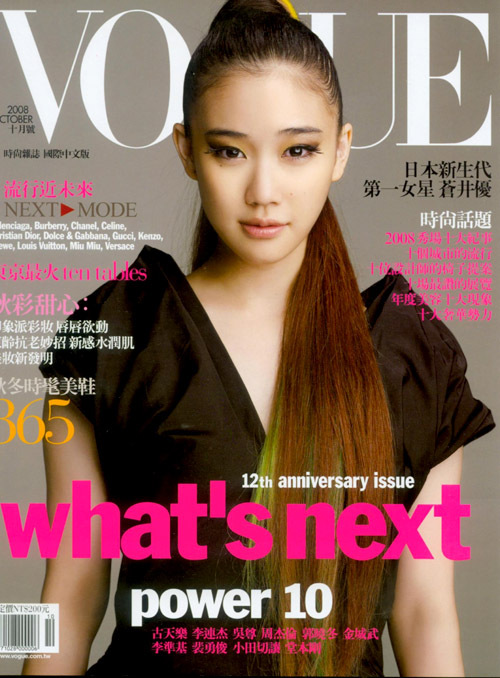 Yu Magazine Batch and Vogue~ | personal.amy-wong.com - A Blog by Amy Wong. Yu just updated her site with a whole magazine batch, which seems the only thing she updates now… which is kinda boring. BUT… they also announce she’ll be on Vogue Japan on December (dunno if on the cover, or just a feature article…) – which leads me to post a great scan of her cover on Vogue Taiwan from last Oct. There weren’t good scans that I’m aware of, so I was surprised to find these. You can find bigger resolution versions here and here. She’ll also be on FRaU, mini, Hanako west, twice on Cut, anan… and SO-EN (装苑), which I will comment on in a later post. I read anan and just imagined this very steamy photo shoot. Do not know if that is what I want…..
at the moment, two Yu posts planned.